MANDAN, North Dakota, October 28, 2016 (ENS) – Law enforcement officials in riot gear arrested 141 people at a demonstration on private land against construction of the Dakota Access Pipeline, owned by Energy Transfer Crude Oil Company, as police attempted to disperse the crowd Thursday. Demonstrators set up the camp just east of Highway 1806 on land the pipeline company purchased from private owners, but which the Standing Rock Sioux Tribe says rightfully belongs to them under an 1851 treaty. Saying the tribe was not adequately consulted before construction across its tribal lands, as required by law, the protesters object to the potentially devastating effects of the pipeline on the Missouri River, the primary water source for the tribe. This river is a major tributary to the Mississippi River where more than 10 million people depend on it for drinking and irrigation. 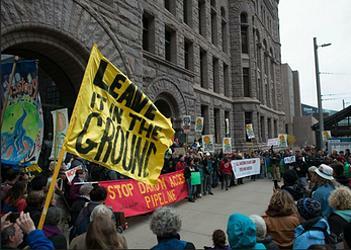 The pipeline would also disrupt sacred tribal places, including burial sites. Indigenous people in prayer circles and a sweatlodge were dragged out and arrested, say eyewitnesses. Law enforcement officials gave a very different version of events. 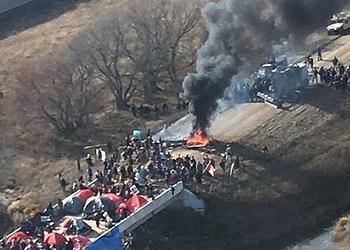 “Officers’ actions to remove protesters illegally occupying the private land and roadway was met with violence from the protesters,” the Morton County Sheriff’s Department said in a statement. “Protesters threw rocks, logs, bottles and other debris at officers. During the arrest of one woman, she pulled a weapon and fired three rounds at the police line. The woman was arrested,” said the sheriff’s department. “Protesters started numerous fires during the course of the day. Protesters set fires on Highway 1806, to three pieces of DAPL [Dakota Access Pipeline] construction equipment, a bridge on CR 134, the backwater bridge (north of the main camp), and numerous vehicles. … Protesters threw Molotov cocktails (homemade explosives) at law enforcement,” according to the sheriff’s statement. A majority of those arrested were targeted for “conspiracy to endanger by fire/explosion, engaging in a riot and maintaining a public nuisance,” the sheriff’s department said. Seven people who used “sleeping dragon” devices to attach themselves to items were arrested for reckless endangerment, the sheriff’s department said. Three were attached to and under a vehicle, three were encased in concrete, and one released himself. An estimated 250 demonstrators against the pipeline were at the site of the confrontation and about 80 others are at another location nearby. Thousands are camped out at Standing Rock Reservation in protest of the four-state crude oil pipeline project. 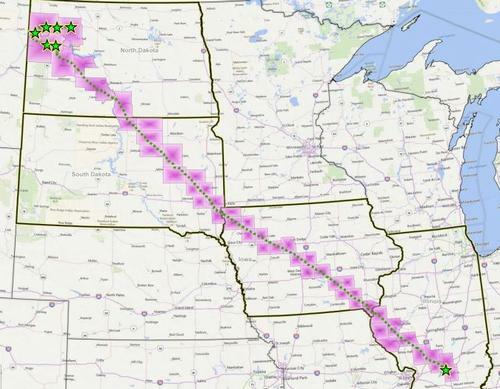 The $3.7 billion Dakota Access Pipeline is a new 1,170-mile, 30-inch diameter pipeline that would connect the expanding Bakken and Three Forks production areas in North Dakota to existing pipelines in Illinois. Company plans call for the pipeline to be ready for service by the end of 2016. The demonstrators were not treated that way on Thursday. Standing Rock Sioux Tribe leaders say law enforcement is overreacting to the demonstrations. “Militarized law enforcement agencies moved in on water protectors with tanks and riot gear today,” said Chairman Dave Archambault II. 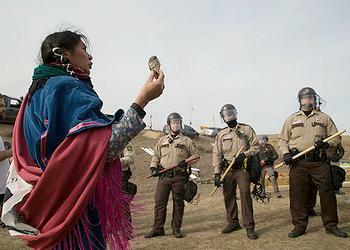 The tribal leader urged protesters to “remain in peace and prayer. Any act of violence hurts our cause and is not welcome here,” he said. While the Justice Department has not yet sent observers, the United Nations has already done so. On Saturday, Grand Chief Edward John, member of the United Nations Permanent Forum on Indigenous Issues, arrived in North Dakota, at the invitation of Chairman Archambault. As a UN expert, he is visiting in his official capacity to observe the impacts of the Dakota Access Pipeline construction, such as threats to water, treaty rights and sacred areas. Grand Chief John is a hereditary Chief of the Tl’azt’en Nation from British Columbia, Canada. He will collect information and testimonies on the escalating levels of repression, violence and intimidation against tribal members and their supporters by state law enforcement, private security and the National Guard. International Indian Treaty Council Communications Coordinator Roberto Borrero is accompanying Grand Chief John as a human rights observer. He is a member of the IITC Board of Directors representing the United Confederation of Taino People, based in the Caribbean. They are joined by IITC Board member William Means of the Oglala Lakota Nation. The IITC and the Standing Rock Sioux Tribe submitted two joint urgent actions to the UN Human Rights system, including four UN Special Rapporteurs, in August and September. The submissions detailed human rights violations and requested that these UN human rights mandate holders call upon the United States to uphold its commitments under the UN Declaration on the Rights of Indigenous Peoples and the 1868 Ft. Laramie Treaty. In his letter inviting Grand Chief John dated October 28, Chairman Archambault expressed the urgency of the situation facing his tribe. “Currently, we are experiencing violence and intimidation from state law enforcement, private security as well as the North Dakota National Guard which are moving to forcibly remove us from our encampment located on unceded Treaty lands,” he wrote.